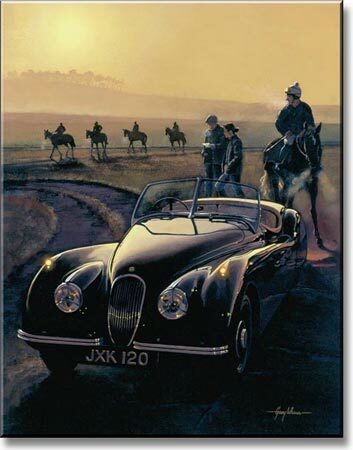 "A Jaguar XK120 fills the foreground in this early morning scene at a racehorse stable. The cool of the morning is evident in the trace of mist in the background and the condensation from the horses' breath, highlighted by the low, rising sun. Whilst many of my paintings are flights of imagination, this one is very rooted in my local surroundings. The area where I live has many stables and it is quite common to come across horses being exercised in the early morning. I thought the curvaceous body of the Jaguar XK120 was the ideal vehicle to capture the low-level light, with the rising sun reflecting off its sensuous surfaces."